Are you ready for disclosure of UFO’s, alien agendas, life in our solar system and black budget projects? If the answer is YES, then you should consider attending Contact In The Desert 2018. The venue is located the Renaissance Indian Wells Resort in Indian Wells, California. 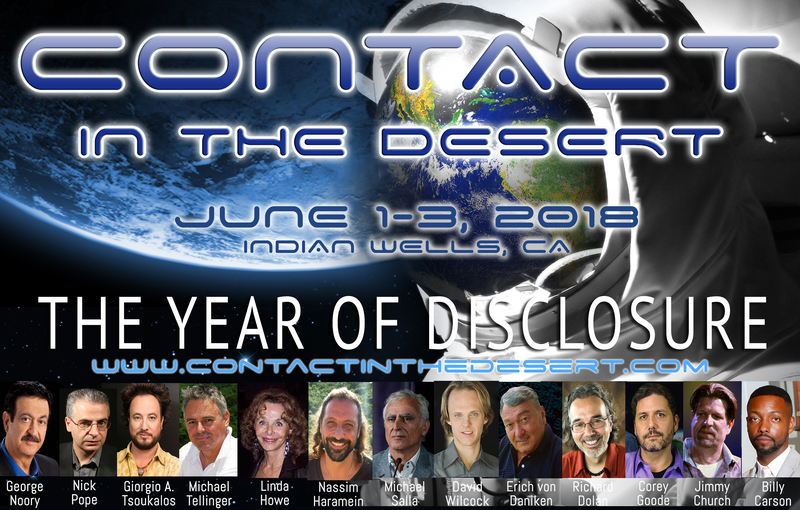 Featuring top-billed speakers such as Erich Von Daniken, George Noory, Nassim Haramein, David Wilcock, Jimmy Church, Billy Carson, Linda Moulton Howe, Michael Tellinger and many more. Billy Carson is an expert host on the new original streaming series by Gaia named Deep Space. The series is an exploration of the “Secret Space Program” and the types of technologies being used along with their potential origins. Carson is also an expert host on Gaia’s original series, Ancient Civilizations. A team of renowned scholars has come together to decipher the riddle of our origins and piece together our forgotten history found in monuments and texts across the world. Billy Carson is the co-founder of the United Family of Anomaly Hunters (UFAH). Carson has combined forces with the top anomaly hunters in the world to form the United Family Of Anomaly Hunters(UFAH). Their mission is to provide enough evidence of past and present life on Earth, and other celestial bodies inside our own solar system, of technologies being used along with their potential origins. The group claims to have pioneered two new fields of science. Archeo-Astronomy and Astro-anthropology. Carson feels that these will be actual college courses in the not so distant future. Billy Carson is also the CEO of First Class Space Agency based in Fort Lauderdale, Florida. Carson’s space agency is involved in research and development of alternative propulsion systems and zero-point energy devices.